If you can’t find the answer to your question here, please proceed to bottom of the page to submit your question to our Customer Support Team. What models are eligible for this promotion? To check the eligible models for this promotion of your claim, please click here. Where do I find my indoor and outdoor model numbers and outdoor serial number? Similar to the outdoor model number, your indoor model number can be obtained from the indoor unit and/or listed on your tax invoice. 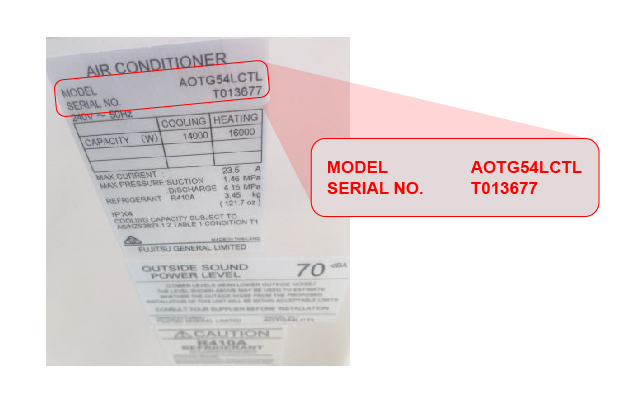 If your outdoor serial number is inaccessible, you can find this information on the box the unit came in, otherwise please contact your installer who will have a record of this. Note: Without entering the indoor and outdoor model numbers as well as the outdoor serial number, your claim cannot be processed. If you have purchased a unit and paid in full, but it is not yet in your possession, and therefore you are unable to provide the outdoor serial number in time to make a valid claim, please contact Fujitsu General Assist on 1300 882 201, to allow for alternate arrangements to be made. How will I know my claim has been received? Once we receive your claim, your Claim ID will appear online and we will send you an automatic confirmation email. The next step of the process is to validate the details provided in your claim, please allow up to 4 weeks for this process to be completed. Once your claim is approved and processed, you will receive a second confirmation email. Alternatively, we will notify you if your claim has been rejected or if we require more information in order to validate your claim. Once you have lodged your claim, you are able to track the status here. Should I claim using my installation address or postal address? Please claim using the address you would like us to send your Fujitsu Pre-paid Visa card to. Note: Unfortunately, we are unable to send the Fujitsu Pre-paid Visa card to a PO Box address and the Tax Invoice MUST show the residential address the unit was installed at. What if my receipt / tax invoice is in a business name? Purchases in business names cannot be approved. Your receipt / tax invoice has to be in your personal name to prove ownership of the Fujitsu inverter air conditioning system. As stated in our terms and conditions, purchases must only be for domestic and residential use, and excludes non-residential applications. What details need to appear on my tax invoice? Copies of receipts / tax invoices are acceptable if they show a $0 balance, along with your name, installation address, contact details, place of purchase and the Eligible Product model number of the air conditioner/s purchased. Note: If you paid for your unit with cash, this must be clearly stated on the invoice. The unit must be purchased in full, with no outstanding balance. What details need to appear on my proof of payment? Proof of payment or transaction receipt (i.e. EFT receipt, bank statement, credit card slip) must clearly show full payment; i.e. amount paid equals that total amount charged for the unit being claimed on the invoice, as well as the claimant’s full name. Note: If you have purchased multiple units in different transactions you will need to include each individual transaction receipt. How do I show that my invoice has been paid in full? As per the terms and conditions, purchase is defined as fully paid for with zero balance owing. Receipts / tax invoices showing an amount outstanding will be rejected. You must provide a finalised merchant tax invoice, along with a valid proof of payment (2 separate documents). What is the difference between my ‘tax invoice’ and ‘proof of payment’? Your tax invoice is the branded store/business receipt you receive at the time of purchase. Your proof of payment is your transaction record, e.g. bank statement, eftpos stub, cash receipt. You must provide both of these when you lodge your claim. You must have an email address to be able to complete the claim form. An email address is required to allow us to email you updates on the progress of your claim. If you have selected to receive an eGift card, this is where the eGift card redemption code will be sent to. If you do not provide a valid email address that you’re able to check regularly (including the junk folder, in case our emails have been incorrectly intercepted), you run the risk of missing out on important notifications regarding your claim. Why do I need to enter my mobile number? If your claim is marked ‘invalid’, and we do not hear back from you after sending an initial email requesting further information, we will then send you a follow up SMS in relation to your invalid claim, hence the reason we request your mobile number. I’ve opted to print and fax my claim form, along with my tax invoice and proof of payment, but my printer has failed! What now? Don’t worry. Once you have fully completed the claim form online, a copy of the claim form will be emailed to you, enabling you to print once your printer is working again or you have found an alternate solution. Please visit our contact page if you require assistance. If you’re not sure if your claim has successfully been submitted, please get in touch with us via our contact page. What is my Claim ID and what is it used for? Your claim ID is a code unique to your claim. This ID will appear on the screen after lodging your claim. It will also be emailed to you to keep for your records. It is important to keep your Claim ID as you will need it to activate your physical Pre-paid Visa card. It can also be used to check the status of your claim during the claim period. What do I do if I have lost or forgotten my Claim ID? If you have lost or forgotten your claim ID, you can find it in the confirmation email that was sent to you after you lodged your claim. Please be sure to check your junk folder. Alternatively, if you cannot retrieve it, get in touch via our contact page. Now that I’ve submitted a claim, how can I check on its progress? To check on the status of your claim, please click here. How can I provide additional documentation that has been requested as my claim is currently invalid? How long will it take to receive my Pre-paid Visa card? If your claim is approved and you have selected to receive a physical Pre-paid Visa card, it will be sent to you within 4 weeks from claim approval notification. Please allow up to 4 weeks for the initial claim validation and approval process. How many Pre-paid Visa cards will I receive? You are entitled to receive 1 card per approved claim. However, if you have multiple approved product purchase claims under the same Claim ID, we may send you one card that has a balance of the accumulated value of all rewards you have received approval for, rather than separate cards for each. The maximum value that can be loaded onto a single Pre-paid Visa card is $999 (the maximum per day cash out allowable), so claimants who are eligible for a total Pre-paid Visa card reward value greater than $999 on approval of their valid claim will receive more than one (1) card. How long will it take to receive my eGift card? I have received my initial eGift card redemption code and chosen where I will be spending my eGift card. It has been over 48 hours and I still haven’t received my eGift card via email. What should I do? The email may have ended up in your spam or junk folder, please check there first. If you have still not received your chosen eGift card, please submit your enquiry via our contact page or call our Customer service team on 1300 134 163 Monday-Friday (9am-5pm AEST). I’ve just received my Pre-paid Visa card in the mail. What do I need to know? Your Pre-paid Visa card must be activated prior to use by visiting https://fujitsu.activateacard.com.au/ and entering the required info including your activation code (which can be found on your issuing letter), your Claim ID (which was provided to you at the time your claim was submitted) and the email address that was submitted in your claim. ACTIVATE BY: Your Pre-paid Visa card MUST be activated no later than 1 week prior to the expiry date printed on the front of your card. Once activated, your card will be ready to use from midday the next business day. No extensions, credits or refunds will be given after the ‘ACTIVATE BY’ date has passed. Once your funds are loaded, your card can be used online or in stores like a regular Visa credit card. You can also withdraw funds from ATMs that accept Visa. SPEND BY: Once activated, the card must be spent by the date printed on the front of the card. No extensions, credits or refunds will be given after the ‘SPEND BY’ date has passed. Can my Pre-paid Visa card be used overseas? Yes, however additional fees may apply due to foreign exchange rates, and transaction fees etc. For further information, please refer to the Product Disclosure Statement. Help! I’ve lost my PIN – how can I get it back? Please visit https://pin.emerchants.com.au/ to retrieve your PIN. Note: rather than using your actual date of birth, you will need to enter the date you received your claim approval email in the Date of Birth field. What is the difference between a Physical Visa card and an eGift card? Where can I spend my eGift card? Am I able to change my mind and swap from a physical Visa card to an eGift card and vice versa? No – once you have made your selection and confirmed your choice, we are unable to modify this. Am I able to use my eGift card in store? Yes, for all the eGift cards available to be selected except Red Balloon, subject to retailer’s specific T&C’s. If you print your gift card first you may use the voucher in store at the selected retailer. You can also scan it from your mobile device. Red Balloon eGift cards can only be used online. Am I able to use my eGift card online? The Coles eGift card can be used at participating Retailer stores or online sites (where applicable). At present, the Flight Centre eGift card can only be used in store or over the phone. These conditions are subject to change. Remember to check the Flight Centre T&C’s when using your eGift card. The Good Food eGift card can only be used whilst dining in at a participating restaurant. The Woolworths Wish eGift card can be used online at selected websites. Please check the full T&C’s for use of this card. How do I enter to win a Family Holiday including spending money? An eligible individual (“Entrant”) must purchase any Fujitsu Cooling only or Reverse Cycle Inverter Split System, Reverse Cycle Inverter Multi Split System or Reverse Cycle Inverter Ducted Air Conditioning System (“Eligible Product”) between 01/04/19 – 01/07/19 (“Promotional Purchase Period”) from any participating Fujitsu retailer or dealer in Australia and lodge their claim form online at www.fujitsugeneral.com.au/promotions by 4:59pm AEST on Friday 30/08/19. All participating Fujitsu retailers and dealers will display advertising for this promotion. All claims that are approved will automatically receive one (1) entry into the draw per eligible product purchased. When is the Family Holiday including spending money prize drawn? On 25/10/2019 at 12 noon AEDT. Who is eligible to win a Family Holiday including spending money? All customers whose claim has been approved will receive one (1) entry into the draw per approved eligible product purchased. The first five (5) valid entries drawn will each win the prize of a family holiday plus spending money valued at $12,000 in total. What do I get if I win the Family Holiday including spending money? The prize is a family holiday plus spending money valued at $12,000 in total. Each prize will be awarded in the form of 2 x $4,000 and 1 x $2,000 Flight Centre eGift cards together with 4 x $500 Fujitsu Pre-paid Visa cards. Can I give my Family Holiday including spending money prize to someone else? Prizes are not exchangeable or transferrable and cannot be taken as cash unless otherwise specified. When do I get my Family Holiday including spending money prize? Each prize will be awarded in the form of 2 x $4,000 and 1 x $2,000 Flight Centre eGift cards together with 4 x $500 Fujitsu Pre-paid Visa cards. The Flight Centre eGift cards will be issued by email and the Fujitsu Pre-paid Visa cards will be presented in person to each of the winners within ten business days from the date of prize acceptance. How do I use my Flight Centre eGift card? You may use the eGift card in store or over the phone at participating Flight Centre stores. In order for an eGift card to be redeemed, you must provide the associated unique PIN number at time of redemption. If a PIN number cannot be provided, the eGift card will not be able to be redeemed. Am I able to use my Flight Centre eGift card online? At present, it can only be used in store or over the phone at participating Flight Centre stores. Remember to check the T&C’s governing the use of your Flight Centre eGift card at the time you wish to use it. What if I have a question that does not appear on the FAQs list? Visit our contact page to get in touch with one of our friendly customer service representatives.